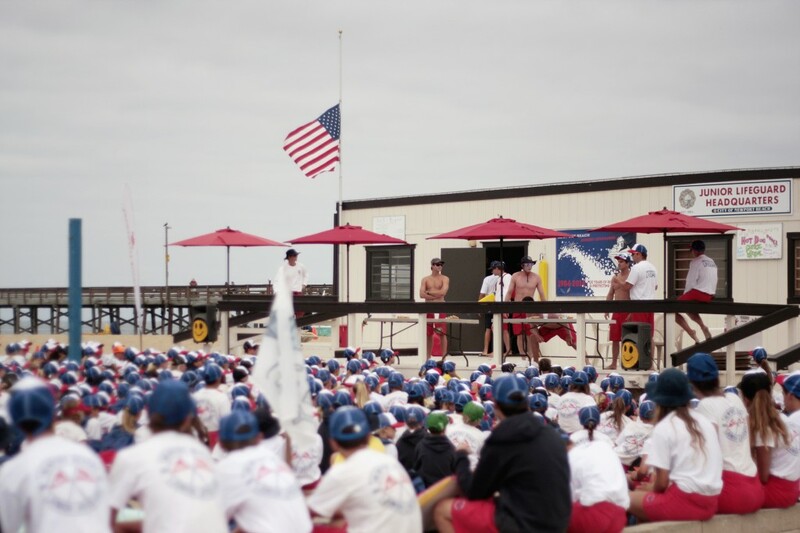 The Newport Beach Junior Lifeguards start their day with morning announcements at the current headquarters in 2014. Newport Beach Public Works staff presented an “early look” into the proposed 2018-19 Capital Improvement Program during Tuesday’s City Council study session. The CIP outlines what will be spent on new and ongoing projects throughout the city, and when the work is expected to take place. As City Manager Dave Kiff quipped in his Insider’s Guide, the “early look” is good opportunity to see when a street you use might be repaired. “…or ‘when can I expect my key commuting road to be resurfaced so that two weeks of my life can be ruined?’” he joked. But since the CIP is still a work in progress and ultimately won’t be approved by City Council until June, no dates were given for road work this week. Public Works Director Dave Webb did highlight some projects of interest, and clarified that their focus is to maintain the existing infrastructure and keep it in good working order. Those projects outweigh new construction. One piece of new construction that was notably absent from the CIP was the Newport Beach Junior Lifeguards’ new headquarters. Last year, the city worked with the NBJG to create plans for a state-of-the-art building near Balboa Pier, but Public Works did not list it in their plans for the upcoming fiscal year. Dixon received many thanks from the large number of people in the audience who had come out to support the NBJG headquarters. Concerned parents, instructors, and former participants in the program described how children are currently forced to use the public restrooms with no permanent building to serve them. They implored Council members to act on a building a new headquarters. The NBJG Foundation, which has been raising funds since last year for the building, has raised $130,927.50 toward their goal of $500,000, according to their website. 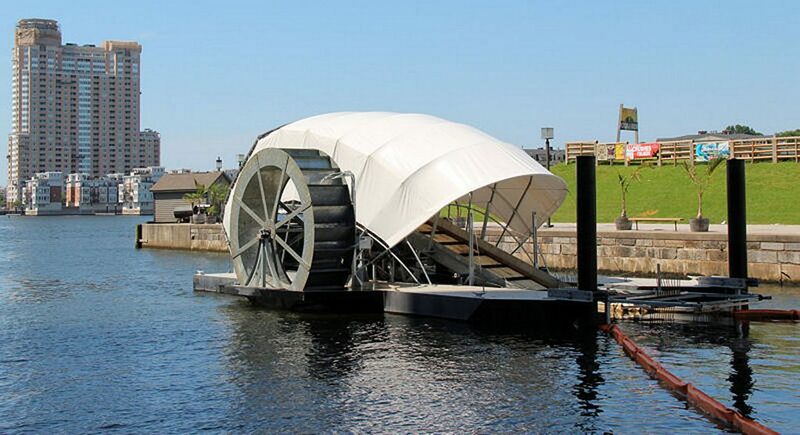 The solar-powered, debris-gathering water wheel in Baltimore, the same concept that is proposed for Newport Bay. Mayor Marshall “Duffy” Duffield said that the council supported the plans for a new NBJG headquarters, but also admitted that he wasn’t supposed to say that. Projects already slated in the CIP include more improvements for Newport Harbor, which will take place in the form of seawalls, dredging, and storm drains, as well as the “water wheel,” a solar-powered, trash-collecting device that prevents garbage from flowing out from the back bay area into the harbor and ocean. Another notable water improvement is the possibility of a new means of drainage on Balboa Island. It’s significant because the island’s residents are some of the most vulnerable to flooding in the city. Webb revealed that they’re considering a revamp of the drainage system on Balboa Island, a system he described as “historic.” Currently, crews monitor the tides and open and close valves to a drainage system, he explained. “We’re looking to automate it and make it more point-specific. We have a lot of drains, and we want to turn it over to a pump system,” Webb noted. Similar systems have been installed in Huntington Beach, Seal Beach, and other low-lying cities, he said. In the automated system, drain water is collected after pumps turn on automatically. Trash is also collected and “low-flow” is pumped off. 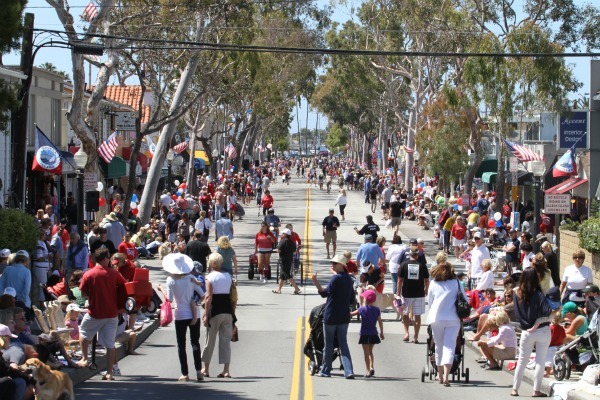 In anticipation of a previous year’s Balboa Island Parade people pack onto Marine Avenue, just one of the island streets the city is looking to replace. The city is just beginning to look into the project. Webb added that it will also help with sea level rise and general flooding issues. Concrete streets on Balboa Island need to be replaced as well. “It’s important that we look at this now, as we get into…replacing those streets. Before the concrete streets are replaced, the drainage system must be updated,” Webb said. Reconstruction of Marine Avenue on Balboa Island, for which an additional $96,000 from the General Fund is being requested, was also discussed. The CIP and the remainder of the budget is a focus for the Finance Department and Finance Committee through June. The budget must be approved by city council before June 30, and goes into effect on July 1.